In this long-running mystery series, sports agent Myron Bolitar gets into some pretty dangerous situations, but his preppy friend Win, with his love of martial arts and technology, is usually there to back him up. 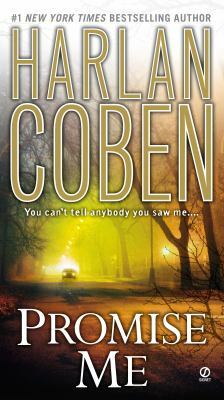 This is the first book I’ve read by Harlan Coben, who took a six-year break from Myron to write thrillers before writing Promise Me. Overhearing his girlfriend’s daughter and another teen at a party talking about drunk drivers, he promises to give them a ride anytime, no questions asked. Aimee calls him from Manhattan at 2:30 one morning, and then disappears after he drops her off in suburban New Jersey. Myron looks for connections with Katie, another missing teen, as does Katie’s mob-connected father. And of course the police want to know how Myron’s involved. Myron has known Aimee and her family for years, and even wrote her a letter of recommendation to Duke University, where he was a basketball star. Plenty of action and violence, mixed with touching scenes with his widowed girlfriend Ali and his aging parents, make for a fast-paced read. I will probably go back to the beginning of the series and read Deal Breaker.